How are we to interpret Daniel 12:4? 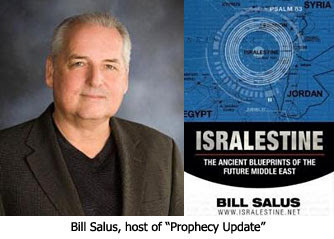 Bill Salus: As we look at the course of Israel's history and its miraculous present existence, we see prophecy being fulfilled. In your book Living on Borrowed Time, you asked 22 Bible prophecy experts a series of questions. Let's look at question number four. But first, I want to segue into it by talking about Tim LaHaye changing his disposition on the interpretation of Matthew 24. We as honest students of Bible prophecy cannot be dogmatic. We look at Bible prophecy through a glass dimly, which is how I like to say it. The closer we get to a prophetic event, the clearer it becomes to us, just as if we where looking through that glass. So, we are still trying to share notes among each other. That's why I appreciate the fact that you sought out the thoughts of multiple Bible prophecy teachers. One of your questions involved how does one interpret Daniel 4 where he says, "Daniel, shut up the words and seal the book until the time of the end. Many shall run to and fro and knowledge shall increase." In other words, Daniel could interpret dreams and was such a good prophet and understood prophecy so well, but he was beside himself trying to interpret the end times prophecies relative to his people. The angel sent to give him the message told Daniel to seal up the vision in the book until the time of the end, because that's when it would be able to be discerned. To reiterate, your question was, "How do you interpret Daniel 12:4?" What were the responses on that question? Dr. Reagan: We had a variety of responses to it. That's what makes their responses so interesting to read. I would say the majority viewpoint definitely was the view that this refers to the fact that in the end times travel and education would be vastly increased. Knowledge and education would both vastly increase. Other Bible prophecy experts said they thought Daniel 12's reference simply referred to the fact that the book of Daniel would be better understood. People would be searching to and fro for understanding of the book of Daniel. They believe the verses didn't have anything to do with travel or education. I think the majority viewpoint was that it did have to do with travel and education. I tend to take that view, because I think that the Bible indicates there and also in the statements of Jesus that in the end times we are going to see everything on what I call the "exponential curve." In other words, there's going to be more hurricanes happening more intensely, more earthquakes happening more intensely, more knowledge, a greater population, and everything else is going to rise as if on an exponential curve. I have a whole presentation about that, as well as is contained in my book. Every aspect of life in the 20th century on was rising along the exponential curve. I call it the Accelerator Principle. This also includes world evangelism. We are just seeing an explosion of growth in every area of life. And so, I think Daniel 12:4 is pointing to that rise. Bill Salus: Yes, I would agree with all three of those points. I think the Daniel passage is dealing with travel, education and information, and also finally a better discernment of Daniel's prophecies. These are the very things Daniel was told to seal up, because it wasn't going to make sense to him at his place and time, but it would make sense to the generation that would need that information. Dr. Reagan: Basically, what the Lord told Daniel there was to quit wringing your hands over it and being worried about it. Just write what He said down! When the time comes for it to be understood, it will be understood. That's one of the reasons I believe we are living in the season of the Lord's return. We are understanding prophecies we have never understood before! Is it possible this sealed book is the same one that is opened by Jesus in Revelation? That possibility just hit me a couple weeks ago since the book is sealed until the time of the end.